The Campus Stores have partnered with Suitable Attire. 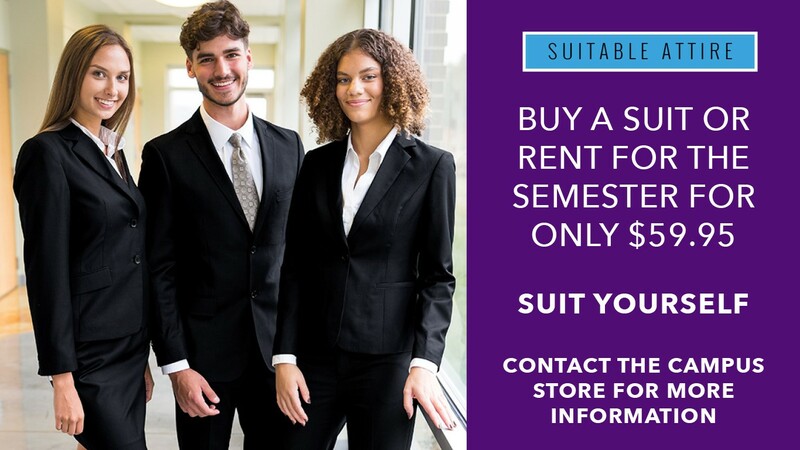 Suitable Attire let’s you rent, buy, or rent-to-own designer-quality suits and separates for job interviews, internships and special events. Their suits are also sold as separates, so you have the flexibility to choose just the pieces you want, based on your personal style and needs. Order a suit jacket and two pairs of pants, for example, or a jacket with a skirt and pants. Or maybe you need just a single piece: a skirt or a pair of pants. Whatever your professional clothing needs might be, they can help. What is included with the suit? Each suit comes with a suit jacket and pants for men, or a suit jacket and either slacks or a skirt for women. You have the option to rent or purchase an additional pair of slacks or a skirt for an additional charge. Are shirts, ties, belts, and other accessories also available through Suitable Attire? Soon you’ll be able to purchase a dress shirt, belt, and tie here or at your participating college store. Are the suits and separates available in any color other than black? At this time, black is the only color offered, but in 2019, additional colors and options will be available. Keep in touch by visiting the Suitable Attire website often or by subscribing to our mailing list or following us on social media. You will receive at least two reminder emails regarding the return of rental books. You MUST return your own rental books. You cannot return for someone else. If this book is being used in an upcoming term, we will buy it back at our next buyback. We have buyback at the end of fall and spring semester. What are the rental periods? January 1 - May 31, May 1 - August 31, and August 1 - December 31. Can I rent a suit or separates for a partial semester? You can, but the rental fee is the same whether you rent the clothing for the entire rental period or just a portion of it. When do I have to return my rented suit? Return dates are posted on the Suitable Attire website and are noted in the email reminders. If I am buying — not renting — will my items be new or a prior rental? New. Any items you purchase will be new and not previously rented. What about after I graduate? Can I still use the Suitable Attire program? Yes, if you participated in the program prior to graduating, you will continue to receive Suitable Attire email offerings and be eligible to participate in the discounted purchase or rental program. How long does it take to receive the items I order? All orders placed by 1 p.m. ET Monday – Friday will be processed and shipped within two business days from the date of order. Shipping times depend on your location, but regular shipping usually takes three to five days. Expedited shipping is available for an extra fee if you need your order more quickly. Please see the shipping table for more information about shipping times and costs for expedited shipping. What if my clothing doesn’t fit properly or was damaged during shipping? Inspect the clothing and try it on as soon as possible after you receive it so you can arrange an exchange if necessary. If the clothing has been damaged during shipping or doesn’t fit properly, contact our Customer Service team at 800-321-3883 or chat to arrange an exchange. Notify us of your intent to return or exchange within 15 days of the date your order was shipped to you. We will process your exchange within 3 business days from the time we receive it, and send your replacement item(s), covering the cost of shipping. You can expect your exchanged item to arrive within 5-7 business days of receiving our "your item has shipped" confirmation email. What do I do if my order doesn’t arrive at the designated shipping address? If you do not receive the suit or separates you ordered by the expected date, immediately contact Customer Service at 800-321-3883 or chat, and we will work with you to track your shipment. Is it okay to make alterations to my rented suit? Because you need to return the suit in the same condition as it was received (excluding normal wear and tear), alterations are not to be made to the suit. If significant changes are needed, we encourage you to purchase your suit. What if I rent a suit or separates but then decide I’d like to keep them? Just keep them! When the return deadline for your rental period passes and we have not received a return from you, we will assume you’d like to keep the item(s), and we will charge you $40 to cover the cost. You will receive an email of the receipt for the purchase of the suit. You can also contact Customer Service at 800-321-3883 to notify us that you would like to convert the rental to a purchase. If I purchase a suit or separates and change my mind once I’ve received them, what is the return policy? Contact Customer Service at 800-321-3883 or chat to receive authorization to return the item(s). Our representative will provide you with a shipping label and return instructions. You must notify us of your intention to return or exchange items within 15 days of our shipment to you. How do I return the suit to Suitable Attire at the end of the rental? Carefully fold and pack the clothes into the original box the suit was shipped to you in. Remove any old labels or cross out old markings, and use postal-quality shipping tape to seal it. Use the return shipping label that will be sent to you in an e-mail near the end of your rental period. Then drop it off at any UPS Access Point™ or The UPS Store®. You can find a location at ups.com/dropoff. What if I lose the box that the suit or separates arrived in? If you no longer have the box, you can return the item(s) in a clean, comparable-sized box that’s sturdy enough for shipping and free of tears, rips, bends, or other damage. What happens if I don’t return the rental suit or separates to Suitable Attire by the due date at the end of the rental period? When the return deadline for your rental period passes, and we have not received the items from you, we will assume you decided to keep the item(s), and we will charge you $40 to cover the cost. You will receive an email of the receipt for the purchase of the suit. What happens if the clothing has been damaged during the rental period? If the clothing is returned to Suitable Attire damaged (torn, badly stained, having burn holes, etc. ), you will be notified within 10 days of our receipt of the item that you have the option to pay a damage fee of $29 (jacket) or $11 (skirt or slacks), or convert the suit or separates to a purchase after rental by paying a $40 fee. If you don’t respond to the choice, Suitable Attire will charge the lower-cost damage fee to your credit card. If you choose to purchase the clothing, the $40 fee will be charged to your credit card, and the clothing will be mailed back to you at your expense. Do I need to have the suit or separates cleaned before returning them to Suitable Attire? No. All suits are inspected and professionally cleaned at the conclusion of the rental period by Suitable Attire.